Help Elsa and Anna inspire the next generation of IT professionals. Home » Help Elsa and Anna inspire the next generation of IT professionals. If you work in IT in the UK you will know how hard it is to recruit good junior IT staff. The schools and universities were switching youngsters off to IT until very recently. I was therefore very pleased to receive a press release from the Government Education Department promoting the new Hour of Code and the uk.code.org website. If you’ve got school aged children the site is a great way to get them into coding BUT perhaps more importantly it’s a great way for parents to learn a little bit of coding so that they can help their children. I think it’s a really great tool for anyone who wants to learn a little bit about software / application development. I’m often asked what people can do to get into IT and I’d say studying this site would be a great stepping stone in that direction. From this you should then be able to get into basic app creation or web site development. Certainly enough to put together a small portfolio to show agencies and future employers…. IT is still any industry where ability and experience count for more than formal qualifications. I loved the simple Elsa development studio, which reminded me of LOGO back in the 1980’s but brought right up to date with characters from Frozen. 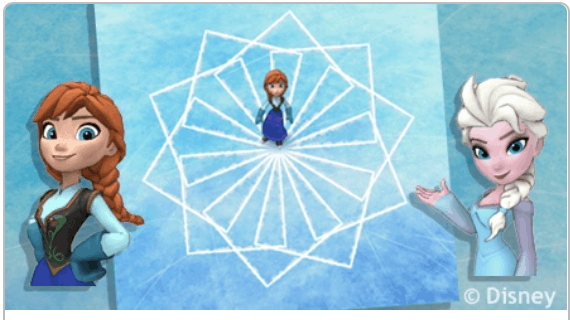 My children who are technically still too young for this were immediately captivated by being able to move Elsa around the screen with some simple instructions…. little did they know they’d written their first lines of code. I’ve pasted in some text from the official government press release below because I think it’s useful. Secretary of State Nicky Morgan is asking parents to consider trying Coding for the first time in 2016 having recently taken her own first coding lesson. Coding for many will seem a far removed and unnecessary skill to learn in later life but the reality is the more parents can support the skills their children are learning in the classroom the more likely we are to ensure a generation of digital natives progress into adulthood. Getting an introduction is easier than you might with the Hour of Code website offering a wide range of introductory tutorials aimed at young and old. After years of switching children off to computing with boring ICT lessons that just taught them how to use Powerpoint the government has done something to help develop the next generation of IT professionals. The new computing curriculum, introduced in the UK during September 2014, has a greater focus on how computers work. Transform children from passive users to active creators of technology, it includes teaching children how to code and create their own programmes. Demand for high-level skills in computing is set to grow, with the UK’s long-term economic future dependent on high-level technology skills. The Government has a vision for a secure cyberspace, contributing to economic prosperity, national security and a strong society. That’s why the government is encouraging a new generation of pupils with the digital skills and confidence needed to meet this challenge. I’d encourage you to give this excellent site a go and recommend people who want to understand IT / Computing.